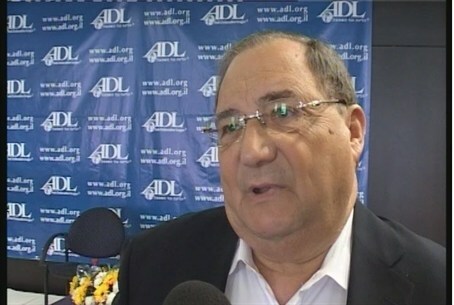 The ADL responded to comment by by hip-hop celebrity Russell Simmons, who said ADL head Foxman "alienated blacks"
The Anti-Defamation League (ADL) responded to a comment by hip-hop magnate Russell Simmons, who in remarks at the Presidential Conference in Israel accused ADL National Director Abraham Foxman of having "alienated blacks" in the same way Louis Farrakhan, racist and anti-Semitic leader of the Nation of Islam, has antagonized the Jewish community. Simmons participated in President Shimon Peres's "Facing Tomorrow Conference," where he and Rabbi Marc Schneier participated in a panel discussion representing The Foundation for Ethnic Understanding. “We've heard this kind of doublespeak before, so it is not surprising to hear Russell Simmons once again making excuses for the polarizing anti-Semitic and racist speech of Louis Farrakhan. He's been doing that for years,” said Foxman, who was also participating in the conference. “What's surprising is that Simmons did it in Jerusalem. What's disappointing is that someone who has a history of having a blind spot to one of the most vociferous and ugly anti-Semites would be given a platform in Jerusalem. And what's outrageous is how divisive and ugly his attack on us was,” he said. “And, finally, what's shocking is that his colleague and partner, Rabbi Marc Schneier, stood by in silence. Where was his defense of this 100-year-old organization that has not only defended against anti-Semitism but has worked alongside the African-American community on some of the most important civil rights struggles in our nation's history? Shame on Simmons, and shame on Schneier.” Foxman added.